Federal and Wyoming laws require employers to post notices informing employees of their rights and protections while performing work for their employers. 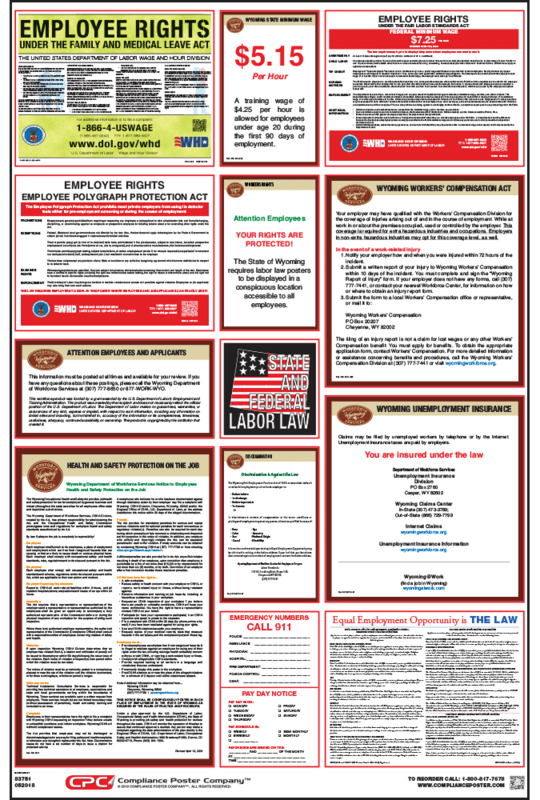 Wyoming Labor Law Posters contain each of the state and federal mandatory labor law notices that must be posted in the workplace. When multiple posting updates are released at the same time, the most economical way to achieve posting compliance is to fully replace the All-On-One poster with the newer version. When only one posting is updated, you can instantly update your existing All-On-One Poster with CPC’s innovative Peel ‘N Post™ update. A Peel ‘N Post is an adhesive-backed posting that sticks over the outdated posting on the All-On-One poster. All-On-Posters are updated with each mandatory and minor change as they happen, so purchasing a new poster is always an option. Wyoming OSHA – (2018) Update reflects telephone number and website where current penalty rates for Wyoming OSHA violations can be obtained. Old penalty rates were removed from the posting. FLSA Minimum Wage posting (July 2016) – Update includes nursing mothers’ rights to reasonable break time and a private place to express breast milk during work hours; revised description of enforcement and penalty provisions; differentiating independent contractors from employees; and QR code. EPPA posting (July 2016) – The penalty maximum was removed to permit future penalty increases without affecting the posting.